The author began work on this article for a very personal reason: He often carries a J-frame S&W .38 Special and wanted to know what loads offer the best chance of surviving a confrontation. Ask me which handgun I would want in hand if I knew I was going to have to defend myself, and the answer would be a 1911 .45 ACP. Ask me which gun I carry the most and you would get a different answer. Whether in my pocket, a belt holster, ankle holster or in the glove box of my truck, when I am away from home the gun most likely within reach is a Smith & Wesson J-Frame .38 Special, a small five-shot revolver commonly called a snubnose and sometimes referred to as a snubbie. It is not the most potent of self-defense handguns, nor the easiest to hit with, but it is one of the handiest to carry in a caliber of sufficient power. Well, the sufficient power part is debatable, but sometimes we simply have to weigh the odds that we will actually need a gun against the very real logistics of having to carry one. Unless one goes into abnormally dangerous areas or situations, many people, like me, are willing to sacrifice some power for day-to-day comfort. Of course, you can now get .357 Magnum power in the same package, but the recoil and muzzle blast are intimidating enough that many who own the mini magnums stoke the chambers with +P .38 loads. That equates to a lot of people who trust their lives to the venerable old .38 Special and short-barreled revolvers. Smith & Wesson introduced the .38 Special cartridge in 1902 in its Military & Police revolver. In spite of the Military designation of the gun, the .38 Special saw little use in the armed forces. The Army had learned a hard lesson in the Spanish American War when the .38 Long Colt revolvers issued at the time failed miserably as manstoppers. Once the lesson sunk in, it only took the military brass a decade to come up with a solution--the 1911. Then 74 years later they forgot the hard-learned lesson and went back to a small-bore handgun cartridge. But that's a different story. The .38 Special did find favor among police since domestic criminals are not usually as difficult to put down as fanatical warriors encountered on the battlefield. There are exceptions,of course. The .38 Special was the standard police issue in most jurisdictions until well into the second half of the 20th century. 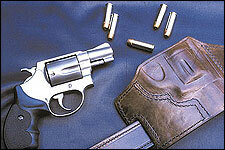 In 1950 Smith & Wesson introduced the small-frame five-shot .38 Special revolver called the Chiefs Special. It was designed as a lighter, easier-to-carry variation for plainclothes police officers but became enormously popular with civilians as well. Other companies have followed suit with a variety of similar designs. These easily concealed and reliable firearms may well have saved the .38 Special cartridge from fading into semi-obsolescence. If that sounds far-fetched, consider that the round doesn't get much respect among professionals these days and is deemed underpowered by many. With the popularity of semiautos, few carry full-size .38s for self-defense anymore. It is one of the most inherently accurate revolver cartridges ever devised and was once popular for bull's-eye competition, but here again action events are en vogue today and the semiautos rule. It is difficult to tell what might have been, but those handy little snubnose revolvers have kept the cartridge alive and well. In fact, due to the widespread adoption of concealed carry laws, the civilian market in these guns is booming with new models appearing regularly on dealer's shelves. These small-frame revolvers are often recommended as lady's guns and/or self-defense guns for anyone with limited firearms experience. There is some logic to this in that the double-action revolver is a very safe, mechanically simple desig; easy to operate; and the snubbies are easy to conceal. They may even fit a woman's smaller hands well. The drawback is the short sight radius, and tiny sights require a lot of practice for one to become proficient. I have introduced several women to handgun shooting, and none of them initially fared well with my Chiefs Special. I recall one lady who immediately took to my full-size 1911 and was soon punching the X-rings out of silhouettes with it. Some claim the .45 ACP has too much kick, but it didn't bother her in the slightest. She then tried my Chief Special and, after one cylinderful, laid it aside and said, "It's cute, but I can't hit anything with it." The lady summed it up nicely. Snubbies are cute. They are reliable and easy to carry. But if a person is not willing to commit to the practice required to place their shots where they want them, quickly and under stress, then there may be better choices. My advice is, don't automatically assume any handgun type is ideal for any one person. We are each individuals and should be given the opportunity to try different designs and make our own choices. There is no doubt from the number of two-inch .38s in use that many people do prefer them. 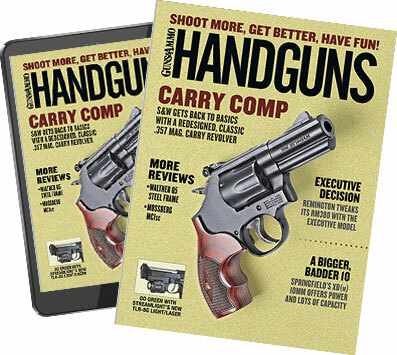 But as popular as these guns are, there are widely varying opinions on the best load to carry in them for self-defense. Most people seem to feel it is an either/or proposition. Either you can use lightweight hollowpoints and maybe get some expansion but limited penetration, or you can use a 158-grain lead semiwadcutter bullet and ensure penetration while sacrificing expansion. Many people feel the .38 Special simply does not have enough power to ensure both expansion and penetration. Are they correct? Jason Weaver of DVC Labs to gelatin-test an even dozen different .38 Special loads in the two-inch barrel. A dozen loads is a small portion of the myriad factory loads available in this caliber, but it was enough to get a fair idea of what to expect from the snubbies. There was nothing scientific about the selection process. I just rounded up as many different loads as I could get my hands on, then culled them down to 12. You will notice that all of the loads except the Hornady 125-grain factory load and the one handload are +P rated. Make sure your handgun is rated for +P before using any of these loads. If your favorite load is not included, it doesn't necessarily mean it was found lacking. Many loads were not included for various reasons, some simply because I could not get samples in time for the tests. Others were culled because of poor performance. Some were underpowered compared to the norm, and one load was actually too hot and tested considerably over the +P pressure limits set forth by SAAMI. Naturally, I discarded it from the tests. Other loads were not included in the test because they displayed wide extremes in velocity. This is common with any low-pressure cartridge of relatively large case capacity. Powders of the proper burning rate leave a lot of empty space in the case, and velocities vary depending on whether the powder is resting against the primer or forward against the bullet. Some of the loads included here have extreme spreads in velocity that would not be acceptable in a more efficient case design. When the selection process was completed, Jason Weaver had 10 conventional hollowpoint loads in jacketed, nylon coated and lead configurations. There are loads on the market featuring ultralight bullets at high velocity as well as frangible and prefragmented bullets, but I decided to stick with conventional weights and designs. I did include one 110-grain prefragmented load as a sample of the type, though. As expected, it offered rapid upset and limited penetration. No surprise there. I also included one handload, an old recipe that has been around for years and touted by some as the ultimate snubbie load. It consists of a swaged lead hollowbase wadcutter loaded backward so that the hollowbase becomes a hollowpoint. DVC Labs tests bullets using FBI standards with calibrated 10 percent ordnance gelatin. Jason's small lab is aimed at supplying tightly controlled tests at reasonable fees for individuals and law enforcement. I found his work to be professionally executed and thorough. Each bullet was tested in bare gelatin as well as gelatin covered with three layers of cloth to simulate clothing. The latter test is very important when determining the effectiveness of a self-defense load since some hollowpoint bullets tend to clog up when passing through clothing and expand less or not at all. Testing using only bare gelatin is fine if you only expect to shoot naked assailants. No gelatin test is foolproof, and it will not tell you exactly how a bullet will perform in a given situation on a live target. However, ballistics experts have ascertained that it is an accurate-enough test medium for making comparisons between bullets and will give you a good idea of how your bullet will penetrate and expand in flesh. It should be noted that when I say experts, I do not mean gunwriters and policemen, among others, but rather scientist trained in ballistics and forensics. The trouble is, even these experts disagree somewhat on how to evaluate gelatin tests. There are different factors to consider and different opinions on the relative importance of each. One factor I cannot show you (due to limited space) is photos of the temporary cavities produced by each load. I don't feel they have much relevance to stopping power anyway. If you are an advocate of the energy-dump theory, you may disagree. I do not claim to be an expert on the subject, nor will I attempt to tell you which load is best for you. That is a task I'm not even sure the experts should undertake. My goal here is not to find the perfect load for the short-barreled .38. I just hope to give you as much information as I can regarding how various weights and styles of bullets perform from the short tubes so that you can make a more informed choice. As I saw it, the main contest here was between the various 125-grain hollowpoints and the 158-grain lead semiwadcutters. As mentioned, these seem to be the two most popular choices, and much debate has occurred as to which is best. It is easy when looking at gelatin tests to focus on one factor while overlooking another. For example, some will simply look for the bullet with the greatest amount of expansion and not consider whether there was sufficient penetration. Others will be impressed with large temporary cavities. With a low-velocity/low-energy load like the .38 Special, the main concern might actually be penetration, but all factors must be considered to make a wise choice. The consensus among most ballistics experts is that 12 to 15 inches of penetration in gelatin translates to optimum penetration on humans, so that is the first thing I look at when evaluating gelatin tests. No matter how much expansion occurs, if the bullet will not reach the central nervous system, I have little faith in it. Once I have identified the loads that give adequate penetration, then I look at expansion. I look not only for the bullet with the largest expanded diameter but also one that expands to roughly the same diameter in both bare and clothed gelatin, and I want it to stay intact. Again, that is my own selection method. You may disagree. Looking at the data, we can see there are a number of 125-grain loads that offer penetration in the desired 12- to 15-inch range. It also seems some of the high-dollar premium bullets pay dividends in the short-barreled .38. For example, the white-boxed Winchester 125-grain semijacketed hollowpoint did not expand well on the clothed gelatin, while the premium load from that company, the 130-grain SXT, turned in a stellar performance. The Speer Gold Dot likewise did very well, and the Hornady XTP, though it did not expand a lot, gave excellent velocity for a standard-pressure load, beating out several of the +P entries, and offered a bit more penetration. The 158-grain lead SWCHP showed that it can offer some expansion, on bare gelatin at least, but really did not outpenetrate some of the 125-grain loads where both bullets failed to expand. I was a little disappointed in the trick handload of a 148-grain backward wadcutter. It plugged up and failed to expand on clothed gelatin and underpenetrated a bit on bare gelatin. As stated, your evaluations may differ, and these tests are certainly not the final word on load selection for the snubnose .38s. They do, hopefully, offer some insight on how some of the more popular loads and bullet weights perform out of the short tube. My thanks to Jason Weaver of DVC Labs for the tremendous amount of work he put into this project.